We’ve seen sites in the past blaze a trail in a niche only to be usurped by a slightly better concept. That’s one of the unstated goals of Favo.rs, a startup that hopes to take the professional relationships model of LinkedIn and put some weight behind the connections. This week, there is, and the value proposition is more focused on what people really looked for when they initially joined LinkedIn. The concept behind Favo.rs is simple: don’t just accumulate connections, use them. The network utilizes a point system that keeps track of favors asked and granted and matches users up with others who can help with particular favors such as retweets, introductions, etc. Favo.rs is designed specifically around a “pay it forward” so that the users are not only accustomed to asking or being asked for help, they expect it. A dashboard (unfortunately bare in my case) allows users to keep track of who they did favors for as well as who did favors for them. As Wired puts it, the startup is essentially a “good ol’ boy’s network” being positioned as a social networking service. The single most important factor surrounding the success or failure of the startup is exposure. It has picked up some impressive press mentions and appears to be growing exponentially after its 1200-user limited beta. The concept is everything that LinkedIn and Facebook are not. It just needs to reach a tipping point in users. 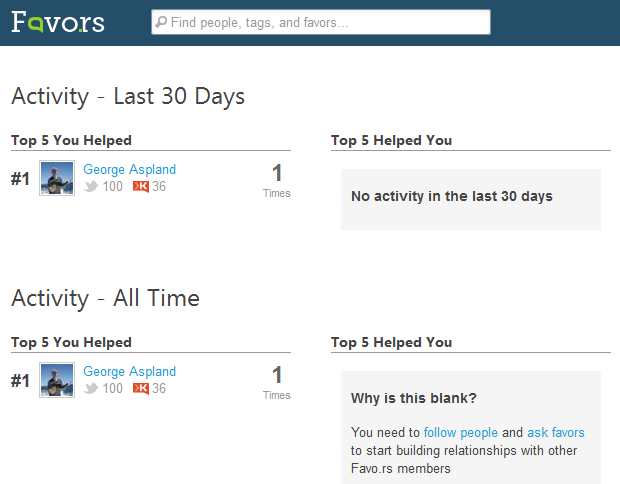 Exploring the site for a little while reveals a positive trend: people like to help more than ask. This is an important precendent to set for the site to explode into mainstream consciousness. People inherently want to help others. At Favo.rs they have the ability to let their helpful ways be tracked (and rewarded) as well as having a venue to call in “favors” when they find themselves in need.